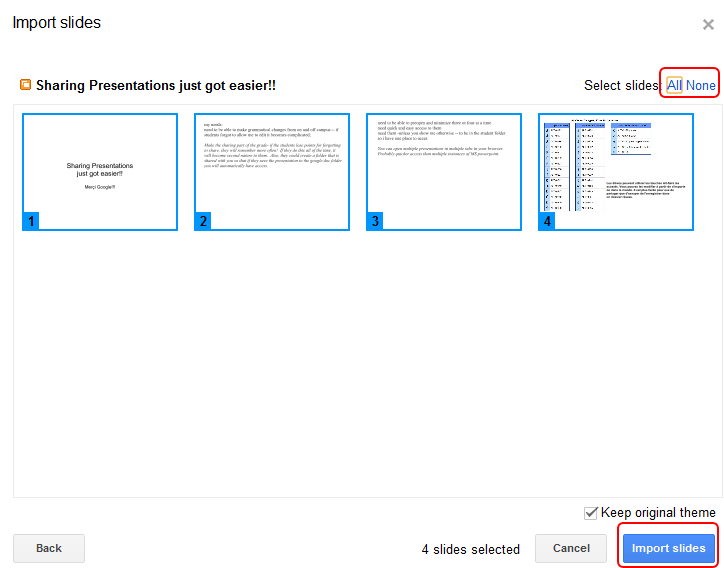 It is quite easy to share a Google Presentation(is it Google Presentation or Google Slides?) using the blue share button, but what if you wanted to just share a link to the actual presentation that you can have auto play or reset after the last slide. It’s quite easy. Publishing the link this way allows you to take away viewership of your presentation at any time or keep others from making a copy of your content. Whether you’re trying to wow your students with an end-of-trimester presentation or impress your classmates with an animated book report, the new version of Google presentations can help. You don’t need to do anything to upgrade to the latest version – we already have it up-and-running for you. Character-by-character collaboration: See updates in realtime as you edit presentations with other people. Drawing on canvas: Draw organizational charts, flowcharts, design diagrams and much more right within Google presentations. Transitions: Enhance your presentation with new ways to transition between slides. Shape linking: Turn shapes within your presentation into hyperlinks to other slides, presentations, or external webpages. Better animations: We’ve added new themes to make it easy to create show-stopping presentations. Commenting: Collaborate with other people by adding comments to shapes, text or slides. How can I open my older presentations in the new version? In order to take advantage of Google Presentation’s newer features, you’ll need to manually copy older presentations into the new version of Google presentations. You can do so by importing slides. 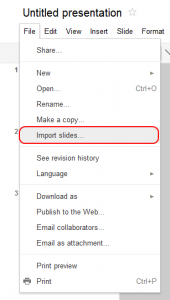 Importing slides is an easy way to reuse slides from an existing presentation (if you’d like to transfer slides from the old version to the new version of Google presentations, for example). Go to the File menu and select Import slides. 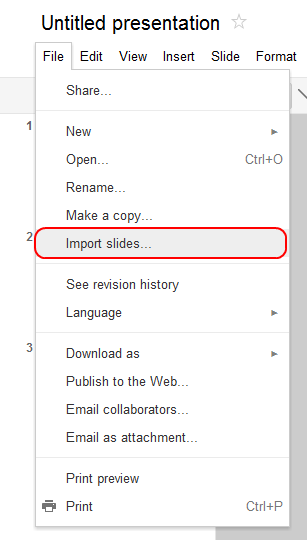 Here, select a presentation that’s already saved in Google Docs or choose a presentation to upload from your computer. Click Select. Choose which slides in the presentation you’d like to import. Use the Select Slides: All option to quickly select all slides, or manually select slides that you’d like to import. Leave the box next to “Keep original theme” checked if you’d like to import your slides unmodified. Uncheck the box if you’d like the slides to fit into the look of your new presentation. When importing slides from an older presentation, you’ll be creating a new Google presentation at a unique URL. You’ll need to re-share the new presentation with any previous collaborators. Eventually, Google will automatically upgrade older presentations to the new version. 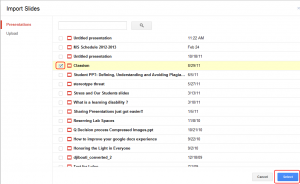 The new version of Google presentations takes advantage of the most up-to-date technology, such as HTML5. For this reason, new Google presentations are only supported in modern browsers. For the best experience, we recommend using Google Chrome, which supports all of the new features in Google presentations. Can I still use the old presentation editor? 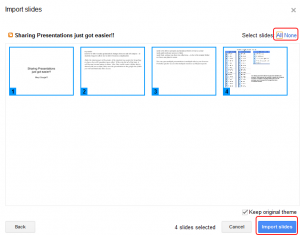 All of your new presentations will be created in the latest version of Google presentations. Any presentation you upload and convert to Google Docs format will be converted to the latest version of Google presentations. 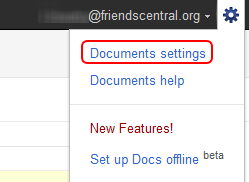 Click the gear icon at the top right of the page in your Documents List and select Documents settings. If you don’t copy your old presentations to the new version, they’ll continue to open in the old version for now. 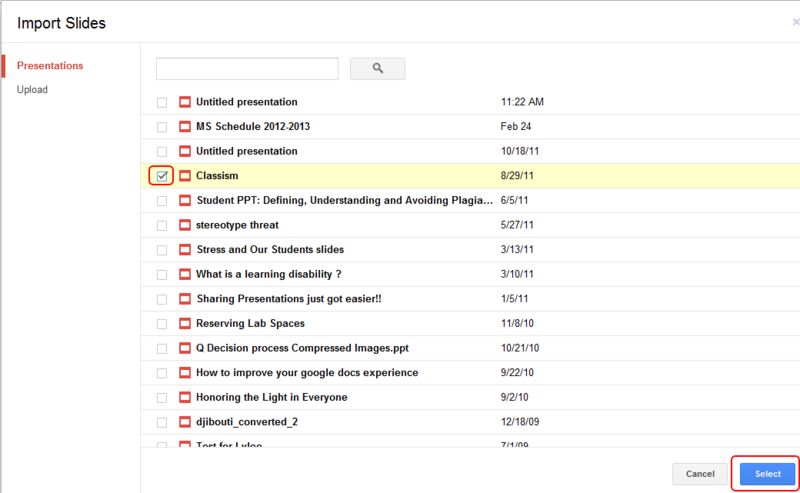 An easy way to tell if you’re using the new version is to see if there is a red plus sign underneath the File menu. If there’s not, you’re using the old version of Google presentations.